The must-read summary of Howard Schultz and Dori Yang's book: "Pour Your Heart into It: How Starbucks Built a Company One Cup at a Time". This complete summary of the ideas from Howard Schultz and Dori Yang's book "Pour Your Heart Into It" shows the inside story of the rise of Starbucks.This summary explains how the vision first came to Howard Schultz and how from that sole idea, he created his first store in Seattle with the aim of introducing real fine coffee to Americans. Starbucks progressively became a very successful international company with stores opening everywhere worldwide. According to Schultz, this success is due to a set of core values he based his company on that don't just focus on profits and growth. 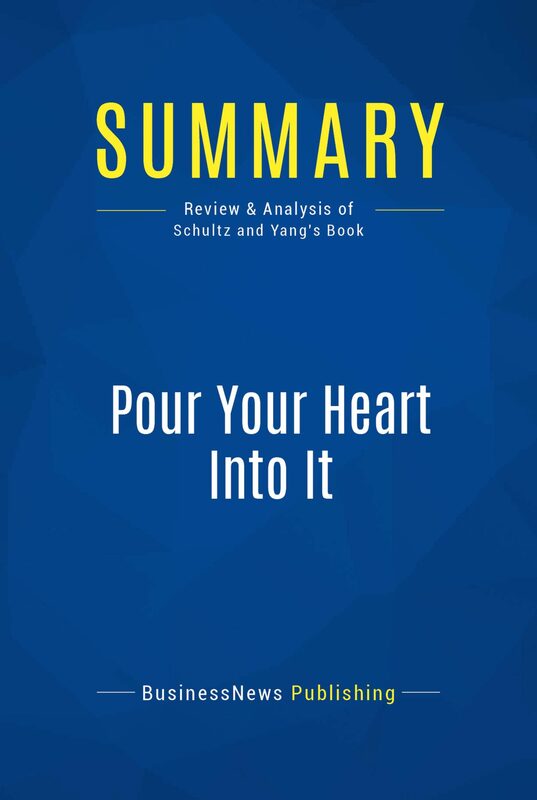 This summary points to the principles illustrated in "Pour Your Heart Into It" and that have made the company enduring constitute precious guidelines for business people seeking to bring their company to the top. This success story is a motivational and inspiring tale, and a must-read for fascinated "Starbucksaholics".Added-value of this summary: • Save time• Understand the key concepts • Increase your business knowledgeTo learn more, read "Pour Your Heart Into It" and discover the key to taking your company to the top. Otros ebooks de BusinessNews Publishing.